1st show in 2013 next week! Eli’s Mile High Club is the place, Saturday October 26, 8pm is the date & time. There is an excellent SECRET HEADLINER and opening is CULTURE ABUSE, a new band with ex-DEAD TO ME & ALL TEETH members- so there’s no reason to miss out! You can buy tickets here- $12 and there will be very few at the front door. 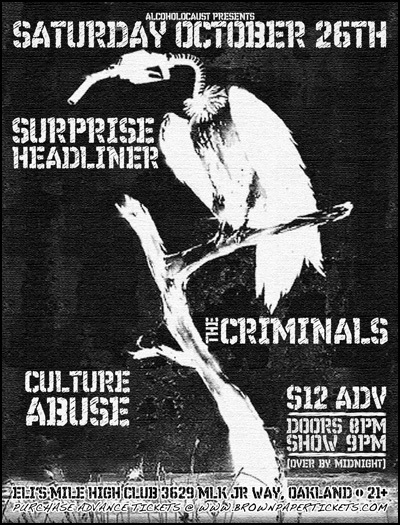 21+ doors at 8pm, CULTURE ABUSE promptly at 9pm. Notes: Secret headliner: FOXBORO HOT TUBS with local opener Culture Abuse.